Far on the bitter cold and dark rim of the Solar System, from deep in a Roncommon-like realm in the ninth Planet, a single red ray beamed out. Plans had changed slightly since the advent of Dr. Pikkard and three Crays into the equation. There would be no waiting for the Black Hole from Sagittarius A West, though it was still speeding toward the Solar System, devouring globular clusters like choice grapes until it contained the mass of more than two billion stars. The ray spanned the nearly 5, 751,000,000 km. to Earth in a fraction of a second, striking North America. Within days humanity--not the things it made but the species itself-- began dying of a rapidly spreading, hitherto unknown sickness. Forest of Shinar, North America. George O’Kelly Little Soldier rode into the ruins of a small abandoned community. He did what anyone seeking his woman-price might do. He stopped to look for anything of value he might take and sell to a white trader at some trading post. He had heard Old Ones tell of doing such things--though he had not yet seen a town or city with living whitemen in it--there being so much sickness, which had taken most of his people as well. In roofless houses and buildings he found only trees, rubbish and drifts of pine needles. Yet an impoverished carnival had made it to Shinar and died, leaving a carousel and some huge, wolf-gnawed bones smack in the main street. Having lived near the mountains of Rushmore, he knew some amazing sights--the giant-carved faces of olden time chiefs carved in stone. Even greater was the lodge fallen from the sky. It lay across Rushmore’s mountains, broken in many fragments but still mighty in size. But though he had seen great stone faces and the giants’ discarded sky lodge, Little Soldier had never seen anything like a carousel before. He really thought he was looking at something enchanted by a passing shaman. Once an old man had come to their village in the land of the Rosebud Oglala and sung about a strange Red Dog Star that had come down from the sky and was doing much harm. He warned of enchantment cast by the star upon men and animals--and when the singer went away he never forgot. He also had a strange dream that came a day after the singer’s departure. A man looking like a great chief appeared holding a plant in his hand. “It will restore life to you,” he said. “What is it?” replied Little Soldier in the dream. “You ask what you know,” the man said. Then he slipped into a pearl and vanished. When an evil wind blew one day in the camp and most everyone fell sick, he still had not forgotten both singer and dream, and thought it might be the Red Dog Star breathing on them and making them so sick. One day he came back from hunting and found the camp silent; they had not gone, they were there, but no one was alive. He ran from the village, his eyes swallowing the abyss that hurtled him into darkness where he must wander forever, alone and lost. Later, he crept back, retrieved his grulla mare and fled into the night. He didn’t know where to go. The whole Earth, now that his tribe was wiped out, seemed hostile. Would he get sick and die? He soon wished he would. At least then his spirit would be reunited with his people’s. But he did not get sick. He traveled far and wide. Everywhere he ate the plants he knew and, if he did not know the plants, he watched to see if deer ate them before he tried them. But he could hunt, and that was the source of his food. He used plants for medicine; goldenseal for colds, plaintain for snakebite, jimsonweed for wounds, and willow for fevers and aches. When he gathered medicinal plants he dried them on rocks, then put them in his bear claw medicine pouch. The pouch also carried his face and body paints. One plant he ate had a deep root--the Lion Plant. Though small and soft in stem, it was extremely hardy and grew everywhere, hugging the ground and refusing to die from frost or snow. He dug it out and often ate it raw to soothe an upset stomach. But it could be made into a tonic if it were dried and pounded with a stone first. He always carried some dried root of it with him. It supplemented his meat diet when he was in desert areas where no green thing grew. In this way he provided for himself--and was seldom hungry. He also carried dried meat and pemmican if he had not found fresh game in a region. Coming upon village after village, each a heart-tearing boneyard, he wondered eventually why he did not get sick and die like the rest despite their using washes and ointments from certain bark, leaves, and seeds, and snuffing a powder from a bloodred resin of a “spirit tree.” Even the powerful peyotl and mescaline they took in sacred ceremonies didn’t save them. It was a long time before it dawned on him his diet had something to do with it. The meat was the same as everyone ate--yet they got sick. But the dried herb root he carried? He gathered more of it and always kept a supply in his pouch, so he never went without. If he found people still living, he asked them what they did to keep healthy. They named many things usually--Mayapple, Snakeroot, Wild Cherry, ground pumpkin seeds, Witch Hazel, and many others. But he gave them a root of the Lion to grow and use. When he came back that way he checked to see how the people were. If they were dead, he often found they had not bothered to grow the plant. Those that did survived. That made him certain he had a true lion of a plant, able to defend people against the world’s most dread disease. It also make him ashamed, to be so well in body when so many others perished or were deathly sick. The carousel was beautiful, though his eye was utterly unaccustomed to such things. Even with wear of decades of wind and snow, gilt stubbornly clung here and there, and the bright colors of the ponies drew him closer. Never had he seen such ponies, for he had only known Kigers. But being still tender in years, the brave got down from his grulla and went up to the circle, each pony pinned by a single, shiny shaft. Carefully, he reached out and touched a pony, not sure there wasn’t a shaman’s spell keeping it so lifelike and still that might not freeze him in the same way. It was blue! No other horse he had seen alive was this color of a certain small bird's feathers. Nothing bad happened when he felt the smooth and glossy blue horse, tbough he suspected it was a lure set by a guardian shaman to trick him. When no panther-spirit leaped out at him he went around the carousel, from horse to horse, finding a white, a brown, a black, an Appaloosa, another palomino, and then a pinto--a pattern that repeated itself until there were forty four little ponies--if he had counted. A tumbleweed blew down the street and flew by in a gust of wind and dust. His hair blown east, He glanced up at the sky, noting the dark clouds gathered in the distance. He should be going, he thought, as the storm was coming that direction. Yet he lingered. He noted that the ponies were different not only in color. Some had open mouths and raised heads. Others had heads turned down. And two on the outside had rolled tails, while all had tails pointed down. He even noticed how the eyes were almost all turned up. Clearly, running in pairs, they had been in a hurry to get away from the shaman, though the pins he had stuck in their backs and bellies would stop them from going away even if the spell were ever broken. The sky had darkened. He heard distant thunder of a big storm brewing and again felt he should go. He stepped up on the carousel, drawn by something else--colored glass set in the inner walls and ceiling along with pretty mirrors of all sizes and shapes. He had seen how much valued such things were in the camp, how they were coveted by women, young and old, and worn around the neck and for bracelets. If he had enough he could buy a woman, that is how much they were valued. He tried to pull off the colored glass and a mirror. But they would not come easily away from the wood. He thought of cutting it off with his knife but the nearing thunder told him he wouldn’t have time. He turned to go, then retraced his steps, looking out at the sky, then back at the glass and mirrors. But there was something else, possibly more valuable etched on one of the pieces of colored glass--a butterfly leading a big canoe overhead. His hair whipping wildly around his face, he stood looking up, not only at the butterfly and ship but the ring of faces staring back at him. It was enough to make him jump clean out of the carousel and whip his horse away from that place--but he could not make himself go. The carved faces were those of young woman's. What would he do with them? he wanted a woman's face he could touch, not a wooden one useful only for burning! The mirrors would get him a woman, he decided. All he would need was one. Ignoring the crash of lightning and the roar of thunder that sounded like tornadoes about to rip through the area, he leaped on his favorite blue pony’s back, his knife drawn. A tremendous blast of wind and upswept dirt and dust rocked the carousel and it made a half turn, counterclockwise. Little Soldier hung on and hacked at the overhead mirror. Finally, he had it without breaking the edges, and he slipped it into his pouch where he kept face and body paints along with some herbal medicines for the dread Dutch disease. Jumping down, he turned to go, then began to stare. Half the street dissolved into a sinkhole, and from it erupted a towering pillar of whirling black sand and water. He dove behind the carousel, which was being drawn toward the gaping chasm, handing on for dear life. The carousel teetered for a moment on the edge, about to topple into the hole, then suddenly the tornado shot upwards and vanished. Little Soldier opened his eyes, half-blinded by grit. He was alive, and grateful for it. The wrecked carousel had saved him or he would have been dragged down into the hole. But what was the animal shape lying in front of him? It looked like one of the ponies from the waist down, but from that point it was a powerfully built man, all colored violet but seemingly thin to the point where the rocks and leaves could be seen beneath him. This was a most powerful spell! Little Soldier began to shudder, then controlled himself and tried to think what the vision--for it was no wooden blue pony--might mean. It really was no horse at all. A man with a horse’s body? The hair of the man’s head was silver and long and curled, both on his head and his beard, and his body now glowed blue and green. The eyes were still closed. Even as he looked the violet faded away and the man-horse took on solid appearance, no longer the cloud being he first appeared to be. Little Soldier backed away, knife drawn. 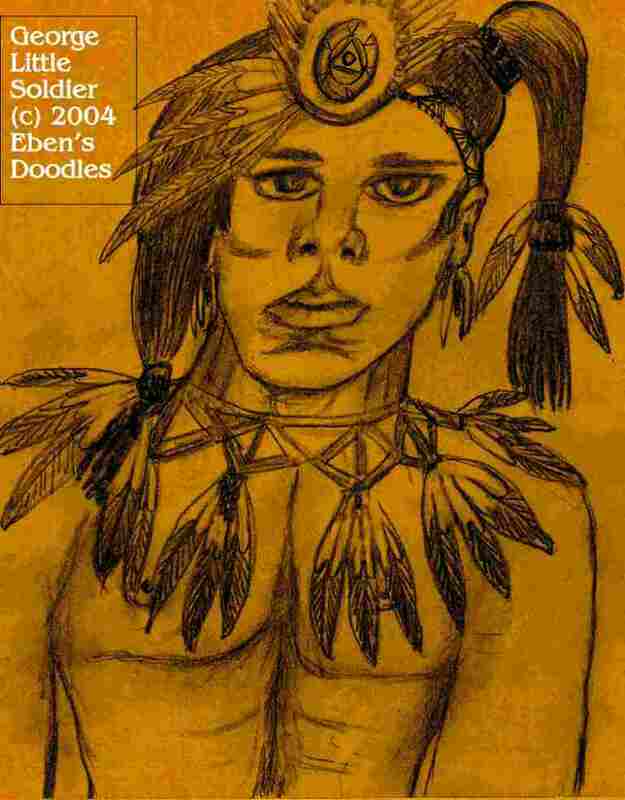 This, he realized, was the shaman himself, come to cast a spell on Little Soldier and add him to the faces ringed above. He was about to turn when he saw something glitter at his feet. Black and shaped like a jewel, it called to his spirit, and Little Soldier picked it up. Without thinking about it, he slipped the stone in his pouch. Moving back most warily, he suddenly fled away into the pouring thunderstorm. But his grulla mare was gone! He couldn’t see, it was so dark in the thick woods, so he turned back to the ruins, looking for shelter. The storm soon moved on, and the light broke on the drenched land. Little Soldier crawled out from the wall where he had crouched. He thought immediately of his mare. He stood and looked around, but he realized it would be a long walk--the horse had bolted and probably had gained miles on him. And in what direction? Rain had washed away all sign of its hooves. Little Soldier just started walking. There was nothing else he could do. He was passing the edge of town when he saw a burned pile of timbers. It made him stop. He felt there might be something he could find--though the buildings had nothing left to take. A metal box was lying on the ground, washed partly out of the bed of ash. He pulled the lid back, rusted as it was, and found something--a bright, golden piece of odd substance that held a blue butterfly, poised in flight. Little Soldier forgot all about his loss of his mare for the moment as he gazed on this marvel. Putting it in his pouch with the black crystal he then left the town. His steps quickened. Now with such a prize he could probably trade for a rifle. He’d have to find a living town of whitemen for that, of course. Before long he found what he wanted--tracks of horses and even carts, a trail through the trees to a whiteman’s town. Hours later, he reached it and was walking down Hennepin Avenue, gazing in wonder at the storefronts and all the people, some of whom stopped to stare at him in turn. Saloons, a blacksmithy, a jail, a bank and church, and a trading post--he had heard descriptions of trading posts, so he recognized it and went in. Later, he left, not with a rifle but three gold coins. He didn’t know what to do with them, but someone noticed his confusion and gave him a shove toward a swinging door. He went through and found a room lit with lanterns and a fat man with a greasy sheet around his middle who handed him a glass of something. Little Soldier staggered out of the building and into the street. His gold coins were gone. They had left him nothing, even the black stone was missing. They had shoved him down to the floor and had gone through his medicine pouch before he awakened and scrambled to his feet and then got away. Dark shadows seemed to follow him between the lightless, ruined, tree-overgrown buildings. Overhead, a tattered and guttering torch of a moon shone on something cloud-high with huge ribs like a well-gnawed carcass. He started walking--the horse-bodied shaman utterly forgotten in his troubles. Little Soldier never did find his grulla mare. 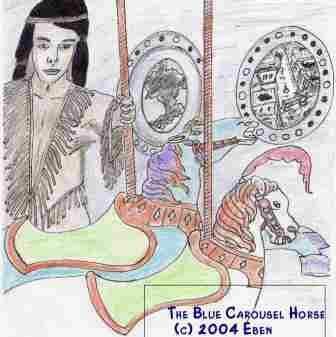 Sometimes he thought of the vision of the shaman with a body half a man, half a horse, but he wouldn’t think of going back to the place of the carousel for a repeat. And for good reason it was his last trip to a living whiteman’s town. A strange place with burning water to drink and people who beat a man when he was sleeping. On foot he would continue to wander the great forests, widely, from mountains to valleys and rivers, even to sealands in the west and south. All the while he traveled he kept clear of whitemen, though their towns and cities were dead--the builders gone, all gone. He marveled at the mighty works they left behind. Where had they gone? Had they all fallen sick and died? He was glad they were gone. If they had been there, he knew he would have to fight. And despite his name he was a man of peace, though he would fight for his life if necessary. When he grew old he would settle down, at a spot not far from the ghost town of Texarkana, as the whiteman had called it. It was still a land without harsh winters, where winter snow only reached to a man’s head. Best of all, not many trees took root on the windswept soil. Nevertheless, he did not remain alone, but Indians came. They called themselves Shos-Shones. They said it was their ancestral land, but they welcomed him because there had been so much sickness among them and now they were very few. When they moved on with their grazing sheep, a young woman stayed behind. In time there came a son, so the line of O’Kelly Little Soldiers did not vanish from the land. They did not get the Dutch sickness, as it was called, since Little Soldier cultivated the root of the Lion Plant that seemed to preserve health in himself and all who ate it. It made a delicious broth with venison that they offered to all who shared their lodge. When their guests drank the Little Soldiers’ coffee, they were drinking the herb as well, for it made an excellent and nourishing hot drink. Somehow the word of Little Soldier’s life-preserving herb spread on the wind. The couple were hosts to many tribes through the years. No one disturbed their peace. Destroyed by the plague, the Aztekan empire had faded away, leaving no trace but its name, which continued on maps for a long time after. Always the conversation at such gatherings came round to the question that was on everyone’s minds. “So your hoop too was broken?” inquired an Omamo Indian refugee from the great river country of the South Continent. It was not an easy topic to pick up even now, many years after the events, so there was no remark for quite a while. “My tribe was one of the first taken, a long time ago now,” replied George Little Soldier when he finally found a response in his heart. “Except for my family, there are no other Rosebud Oglala in the land. Someday maybe my sons will go back. But now I am too old and cannot get on my horse.” The stranger nodded. “We too have lost many, many. But I will take your little lion with me and perhaps he will roar and frighten the destroyer away from our tribes!” “He is small but mighty,” observed Little Soldier, his eyes laughing in his unsmiling, time-furrowed face. “And he can take root wherever you put him. His seeds fly on the wind and will do the rest of the planting. You will never go without.” As often as not, Little Soldier would be asked to tell about the visit of the singer many years previously in his youth, the one who warned the tribe of a Red Dog Star. But the words were meant to be sung. “I will sing the song, the words he left with us.” “No, husband,” said his wife. “It will take all your strength.” In his quavering voice, white-haired Little Soldier sang. Fish in the stream, a leaf on the branch, the blade of grass, they can speak. Children, listen to them! What you cannot see, or take in your hand without hurt like the bright-winged fly of many colors, That is what they are telling you about! Be careful what you seek to hold in your hand, my son! In the day you fall down and weep beside the stream, look at the many brother spirits that have already come there to find relief. Why are they all wailing? Why do they burn with unslaked thirst? Each was a strong brave in his time. He seized a treasure he could not keep, for it burned up his heart and then his hand, and still he would not let go! The land gives up her shore to the sea and gains many good fish. The mountain gives up to the plain and the valley and is provided with fruit and a multitude of animals. The flower gives up the seed. The tree gives up the fruit. Together they inherit the wide lands. But I am old and foolish, say the young men. I lost only what my weak fingers could not grasp, they think. But let the women gash their flesh and cry! I sing of a mighty man, a chief of chiefs. He fell in no battle. He had already fallen to a cruel thing, the Red Dog Star. He lost many horses, braves, and fine blankets on the day the Star became angry and burnt up all he had. His wife and children were taken by his enemies. His heart melted within him. He hid himself in far lands, in the South where the wounded birds go and die, in the land of rivers that drown the land, in a black, smoking tipi of spirits where no man-child drinks from his mother’s fountain. He ran from the Star which he thought his servant. His legs were swift as a young hare’s, but it flew to where he was and slew him. Little Soldier fell back on his blanket, exhausted, but he had faithfully sung every word as he had heard it. He forgot many things, but never this song. It had burnt itself into his soul, though he could not say for sure what it meant. The Omano turned to him after a period of silence. He was perturbed. “You sing well, Old One, but I do not know this chief of chiefs of whom you sang. Can you give his name?” Little Soldier feebly shook his head. “It has been forgotten, perhaps, long ago. The man who first sang the song to us went back to his own country. My people laughed at the song. It does not matter. It is a warning, I think, a dark saying that cannot be rightly interpreted until the time has come.” “But the words speak of my own country. Ours is the land whose rivers drown the land. You have one great river, but we have many such, and then there is the one that gathers all waters together in his hand. Since the song speaks of my land I must go back and sing this song to my people--to those that still draw breath. If the Star of the song can do such things to a man, then it is a good song to warn us of it! I cannot laugh with the young men!” The wanderer paused and stared gloomily toward the lodge floor. “No, I have no laughing in my heart these days. There were few Omamo when I left to seek help. Maybe there is only myself now. But some may have run off and are hiding away from the village. I don’t care about my life anymore. I am going back to the land where my fathers are buried!” The visitor left to begin his long, long journey, carrying away Little Soldier’s song to the Southland. Far to the north of these happenings a strange thing was also talked about in the years that followed. Some claimed they had seen a most strange and wonderful new animal, half horse, half man, painted all blue. The thing was never really proved. The reclusive creature, whatever it was, inhabited the most solitary parts of the mountains, finding shelter, it was thought, in ice caves.